If your Jack Russell terrier has ever had that not-so-fresh dog smell, you likely wondered how to remove the odor. Dog smell usually occurs after a canine has become wet. If the hair is not blow-dried, foul-smelling bacteria begin to grow on the hair and skin. Jack Russell terrier hair is typically quite coarse and thick and blocks most airflow to the skin, creating a perfect environment for bacteria to grow. Fortunately, however, there are ways to remove the scent and prevent your Jack Russell from smelling like a dog. Bathe your Jack Russell terrier with dog shampoo. If your dog has sensitive skin or is prone to allergies—as many Jack Russell terriers are—use a hypoallergenic or oatmeal shampoo. Rinse the shampoo out of your dog's hair completely to prevent irritation. 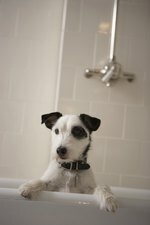 Place a towel on your Jack Russell terrier and try to remove as much of the excess water as possible. You likely won't get the dog completely dry, but using a towel does get quite a bit of the moisture out of the dog's thick hair. Dry your dog's hair using a blow dryer. Drying your Jack Russell's hair with the drier immediately after it has been bathed will likely prevent the dog smell from recurring. Place the dryer on low heat and hold it about 1 foot away from the Jack Russell to prevent burning the dog. Be sure to get the air underneath your dog's dense coat or else the smell may develop. In addition, buy a blow dryer that makes the least amount of noise possible. Jack Russell terriers are a nervous, hyper breed that may become excited by or possibly even attempt to attack the blow dryer. If your drier is relatively quiet, it may prevent your dog from becoming upset by its presence. Spray your Jack Russell terrier with a conditioning grooming spray to add a fresh scent. You can apply the spray whenever your dog starts to smell bad in between baths.